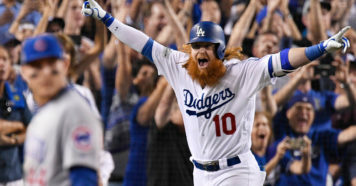 It was the winter of 2013 and infielder Justin Turner saw a call from New York Mets GM Sandy Alderson on his cell phone as he was headed to a Players Association meeting. As Turner told Jayson Stark in the latest episode of Stadium’s Baseball Stories, the call left him stunned. “I had to stop for a minute and try to figure out what I was gonna do. Am I still gonna go down there? What do I tell everyone?” Turner pondered on his way to the meeting. Up until that point, Turner’s career in New York could be best described as middling. Turner never hit better than .280 and hit just eight home runs over parts of four seasons. According to those close to the situation, the Mets’ decision to non-tender Turner — despite his competent production off the bench and minimal salary — was because of his lack of hustle. “Don’t assume every non-tender is a function of money,” Alderson said at the time. 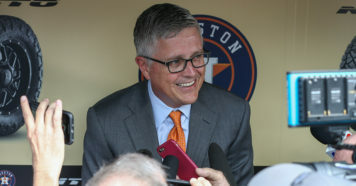 Turner later scrutinized New York Mets management for using anonymous sources to belittle players on the field. When he was cut, Turner was 28 years old with his so-called “prime years” already behind him. So what options were there for the Long Beach, California native with a career .260 average? A return home to Los Angeles in 2014 as a non-roster invitee with the Dodgers was where it all would turn around. A complete tear-down and rebuild of his swing was needed for Turner to elongate his career and earn a spot with the Dodgers. 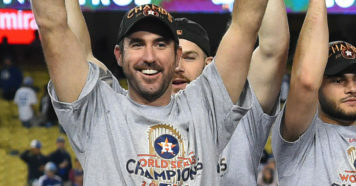 Turner started the process in the winter after his final year in New York, working with journeyman outfielder Marlon Byrd and L.A.-based hitting coach Doug Latta. That repetition really came down to timing. Turner was consistently getting beaten by pitches high in the zone, while still mashing everything thigh-high or lower. He moved up in the batter’s box in order to better identify and attack breaking pitches and added a much bigger leg kick into his swing, allowing him to better time the ball and use his natural athletic ability to hit the ball harder and with more power. Turner also became one of the earliest adopters of the MLB-wide obsession with launch angle. As Turner’s swing improved, so did his numbers. In his first season in Los Angeles in 2014, he upped his batting average to a remarkable .340, notched an OPS of .897 and drove in 43 runs in 109 games. Then, his power numbers began to climb. Turner hit 16 home runs and drove in 60 RBIs in 2015. Turner played in a career-high 151 games in 2016, mashing 27 home runs and driving in 90 while hitting .275. His 4.7 WAR was third-best on the team behind Clayton Kershaw and Corey Seager. The Dodgers would make the playoffs, but lose to the Cubs in the NLCS. Turner came in 9th in National League MVP voting. Then, four years after that devastating phone call that ended his career with the Mets, the Dodgers rewarded Turner for his turnaround. Turner signed a four-year, $64 million deal with L.A. that offseason. Not bad for a former castoff and non-roster invitee. Turner backed up his new contract in 2017 by upping his average to .322, leading the team in WAR and helping the Dodgers to a revenge victory over the Cubs in the NLCS. He again earned MVP consideration, this time finishing 8th place in voting. His iconic walk-off home run in Game 2 of the NLCS against John Lackey came on the 29th anniversary of Dodgers legend Kirk Gibson’s walk-off shot in Game 1 of the 1988 World Series. Despite all of his success, the question remains whether this late-career renaissance will continue well into Turner’s 30s. Turner is 33 and his 2018 campaign has yet to begin due to a wrist injury he suffered in spring training. The injury did not require surgery, and Turner took on-field batting practice for the first time on Sunday. He will presumably embark on a rehab assignment soon. Turner is expected to return to the Dodgers lineup in mid-May. For a Dodgers team that sits in fourth place in the NL West, Turner’s comeback couldn’t come a moment too soon. To follow the Baseball Stories journey, subscribe for free at WatchStadiumStories.com.